I found my first pair of skates in a skip (blue ‘rainbow’ quads with yellow wheels) aged 10, while walking home from school a different way. 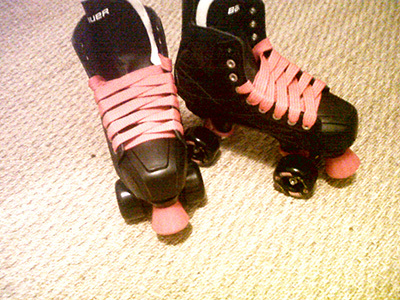 I tried one on and scooted about and then on finding the other skate I skated home for the first time. I left my shoes at the skip and they were not there once my mother sent me back to get them. I really did swap shoes for skates! I was hooked and the rest (as they say) is history. The first 10 years I was a quads only girl, training and competing in artistic figure skating (sequined dresses, double axels and triple toe-loops). Then after a 4 year skating break at university I got my first inline skates and I’ve now been nearly 20 years on inlines. I haven’t touched quad skating in all that time and I decided it was time to get back to my roots and get myself some quads in 2013. I called Steve and Lee at www.quad-skates.co.uk and in one happy conversation I was all decked out in everything I need. I can highly recommend them for their selection and advice on anything quads skate related, but Steve built me these skates from scratch taking into account everything I wanted. I am wearing; Bauer Nexus boots (very comfortable and solid), 1 set of black Krypto Cruise 62mm wheels, 1 set of Bones Reds bearings (with 8mm spacers), 1 set of pink Playmaker Hangers on black Playmaker chassis, pink back stop, pink Airwave stoppers and pink Brites laces. What more can I girl ask for? I spent 2 hours in Hyde Park last Saturday afternoon and road tested them for the first time. Delightful for dancing and so much easier than inlines for basic balance and dance steps. But speed is seriously compromised compared to inlines, but this does provide a good work out for backwards crossovers. But for dance I am sold, and plan to do a lot more dance skating and learning and teaching this year.